KPW can process almost any type of metal substrate and can handle a broad range of shapes and sizes. 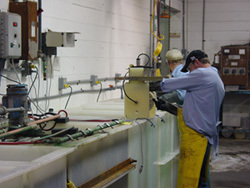 KPW's primary customer base for plating and metal finishing services is the northeast portion of the United States. However, we are not limited to any one geographical area. We service customers throughout the continental United States, Canada, Mexico, Europe and Asia. We are more than willing to negotiate shipping and lead-times anywhere in the world.